I don't know about all of you, but I'm, for the most part, just a programmer. To which, it's pretty easy to share code, and equally as easy to tell when you can reuse someone else's work as a library, engine, or borrowed code snippets: they usually include licensing along with the code to tell you what you can, and cannot do with their work. With the other parts of making a game, it's not so clear, especially with art, music, and SFX. ZUN clearly says to not use his stuff, but other individuals aren't so clear about it. Along that thread of thought, I decided to look for free to use, public domain, or Creative Commons assets for my Touhou fangames. When using any of these, please assume that you are to credit the content creator! Alternative cutins drawn by dairi (aka Haruka). There isn't really anything as far as dairi's art goes, that is free to use cutins and a few Japanese Danmakufu users who created HD versions of ZUN assets, though the readme is abit odd to make out using Google Translate so you should either ask them upfront (usually a twitter link or something is included) or have someone translate it for you. Most of us tend to make our own, anything that isn't character art shouldn't be too hard with some Photoshop practice. HUD elements, spritefonts, text images are all easy to make. For characters you should search around places like deviantArt or pixiv(similar to dA but used by Japanese artists) for commissions. If you need HUD elements or spellbackgrounds, etc... (except for character art/sprites), I can offer my services for free. I'm in the same boat. Shot SFX are somewhat easy if you are okay with using BFXR. I'm trying to contact someone on YouTube about their music remixes but haven't got a reply yet. For art I find searching forums and deviantart best. Asking is easy if the user is still active. I'm actually trying to learn to draw for my game to replace the "probably not ok" assets I have as placeholders. It's hard since I don't have much of an interest in drawing yet, hopfully once I'm over the initial learning curve I'll like it (hopefully it is only an initial learning curve like programming...). GameMaker Shmup: Make a Replay System! 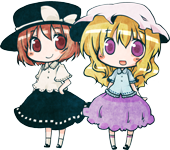 The 講座・素材リンク集 page at www.danmakufu.net has a collection of Touhou materials. http://www.ikiya.jp/ is a collection of vectors that are commonly used as spellcard backgrounds (even ZUN uses some of them). They have a free pack and paid packs. I'd like to echo what was said earlier; asking content creators or commissioning works is a good idea. Also, as far as I know, you can also use Concealed the Conclusion sprites for danmakufu scripts, and Touhou Puppet Play(GBA version) for RPGs, if needed. You could probably find some general stuff at OpenGameArt.org. In line with gtbot's ikiya mention, here are some more free traditional japanese patterns. I think I should make a link in the Info sticky to this thread eventually after organizing the data. Having the first post updated with content posted in the thread will also be extremely helpful. Aye, if orginal user can't do it I'll do it on time base. Will see when I get home. I'll try to keep it updated on a daily basis. Thread linked in the great information thread. Like I said in another thread Nico Commons is terrible for the purpose of finding truly free sounds because most of the stuff there are obvious straight rips from games and other media, and the admins do nothing about that... It's exactly as good as downloading random sounds from random sites and hoping they're all legal to use anywhere. Most of them wont be, regardless of what the owner of each site may claim. This is true of any website that anyone can upload to. You just have to be careful with what you're downloading. You can still find original sounds and images there, of course, just like how you can find rips. To be honest though, if you plan on selling your work, I'd suggest shying away from here, just to be safe. The Alphes imitation portraits terms can be found at this page. You may use/edit the images free of charge. However, you may not use them if you plan on selling your product, doujin or not. Ye most of the stuff also posted on that nifty something url site are also similar, except few of them do have license for usage and such. Regarding publishing of borrowed material, if you can trace down the original author and cannot find any rules for the usage you might as well use common sense and drop an e-mail to the person. Can we modify them of it's just use as they are? And also, can we use and/or modify sprites from Spell Card Collection? (boss sprites are the same in both game if I'm not mistaken). Even if most pepole use his players/boss sprites and other HUD stuff. Therefore all (or at least almost all) the scripts here don't respect what ZUN want? Or is there any tolerance about that since there are not full released games? And what about the Zun's players sprites in Helepolis' Touhou Hou Enbu for example? This is correct. When it comes down to distribution around the forums and such, this is generally ignored for the sake of the convenience of having resources for script creation (or because of unawareness), but if we were to truly respect ZUN's policies we shouldn't be distributing scripts with ripped resources at all, whether they're "polished" scripts or not. I highly recommend not to make use of ZUN's materials if you intend to spread a script beyond this forum and related communities, since it's indeed in violation of derivative guidelines. It is true that we as a community are or have been violating the ZUN guidelines (just like other communities, including Japanese). But that doesn't mean we should continue to do so. Based on previous years, we have been developing and creating our own content and depending less on ZUN's official data. In my opinion this is a good development. Of course, we highly discourage by default to use and publish ZUN's data. Especially if you intend to publish it to larger communities or online. If you stick to PH3's default resources and CtC resources in non commercial methods, you're safe. For beginners and leisure scripters, CtC + Ph3 is more than enough in my opinion. It becomes tricky once you start using ZUN-data. Instead of ZUN-data, try to remake it yourself. I cannot start policing and banning people for their ripping unless it entails an official request from the owners to our community. Every person is highly responsible him/herself for his/her own creation. @Lefkada , Of course this incident doesn't exclude my recent game but that is one of the reason as Sparen said I am replacing the data. Once my game is finished I hope to contribute to the community my own ZUN-mimic'd bullet sheet but you will have to grant me some time as of obvious priorities currently. I always think that ZUN allows reuse of his stuff. I have tons of ZUN's stuff in my ressources :'( (and almost Tasofro stuff and animations). Helepolis> Okay. I know you do customised things (like portraits) but I thought the screens in your project thread were definitive. Anyway, doing ZUN's like characters is not *too* hard. With time, photoshop/GIMP knowledge and a little patience, you can make pretty things without real efforts. If it interest someone, a little tutorial about how I proceed. It's not pure art but I think it's more or less the same quality of ZUN's (old) sprites. Step 1: Do an approximative shape of your character with flat key colors. Be sure to use pure pixel art and not blur/smoth brush. Step 2: Add colors and details on your sprite to make volumes and shadows. Obviously you can refine the base shape. This give you the main shape, used as a base for all the poses of the sprite. Step 3: The step 2 final sprite will be the main pose. Copy it (twice in my case but you can do more) to get base to do your animation frames. Then, you can start edit these poses to make the frames of the animation. You don't need to have real knowledge in animation to do that. Just do as you feel. You can eventually correct that later if it do weird things. This will be the idle pose. I recommend to do only the main animation edit (aka the dress edit in my example) and keep the others edits for the finalization. Final Step: This time, use resize tool of your graphic software to make an artificial blur by increasing/decresing each frame by one pixel. I use this to hide all the aproximatives things I do with pixels. Now, do the last littles changes, like hair animations, color changes, etc. Note that I use the main pose twice as a link between the two others frames of the animation. Now you can test it in danmakufu and return to last step until you are satisfied . The options are maed with ZUN's Sanae's options. I wonder if it is necessary to change it since it is not really difficult to do exactly the same thing and it is really hard to do the same kind of thing without do exactly the same. Obviously you can use my Sanae (until you don't claim as your own ) even if I prefer you use this mini-turotial to make your own players and characters sprites. I hope it can be helpful for some scripters that can't have help from real artists. PS: sorry for my very bad english. I hope it remains understandable. Your English is fine, don't worry. Reuse? I think you mean: Remake? Because using his data was explained above. Remaking is no problem, even if you 1:1 remake it. As long as it is selfmade. And my screenshots aren't definite, content will change as more and more I get work done. Also: That is a nifty tutorial in my opinion, that is exactly how I did the Reimu sprite remake for my game. Pure pixel art and flat colours > followed by applying burn/dodge tools with Photoshop to give it more "3D" then applying some alternative animation by warping/moving/respriting bits. ZUN uses 8-frame animation for his players, but I don't have that much time nor skills to make a unique 8-frame animation. A simle 4 frame for idle + movement is more than enough. Remaking is no problem, even if you 1:1 remake it. Like remaking exactly the same thing with the sames pixels at the exactly same place? Anyway remaking Tasofro gfx is really hard. I think it's the best way to do Touhou sprites (and probably the way ZUN use). 1. Using game data other than screenshots is forbidden. 2. If you need data other than screenshots, please make them yourself. Anything ripped from official games is not allowed in derivative works. We don't care here (as long as it's a hobby non-profit thing) but your mileage may vary elsewhere, especially in the Eastern circles. There's actually a much more explicit list of what is and is not accepted on the official DNH documentation. Most of it follows from "don't use my stuff" so I haven't been bothered to translate it. While we're on the subject of making your own stuff, you could "cheat" a little and make player/enemy sprites from 3D models. It probably wouldn't need a lot of detail if you're making a shooter, but if you want to do something where you need more detail like a fighting game you could use MakeHuman to get a base body shape and work off of that. Anyway, I think it would be neat if a bunch of people on this forum got together to make a collection of custom assets for making scripts. That could save people time looking for stuff to use. What am I? TRICKYSTEAKS I AM! A stick of the tricky variety. I believe some people do that, like arby26 and his entry to the latest contest hosted here on RaNGE. Interested in playing some boss fights I made? Have Danmakufu? Then check out my Danmakufu creations! That Mima fight somehow made me feel all delighted. I think the combination of graphics, sound effects and especially the music. One of the music instruments reminded me of Bubble Man stage in Mega Man 2 I believe with the mellow-tone. The Wiley wars had more upgraded instruments version than the NES. Is that the Concealed the Conclusion's sounds are free to use? I try to make custom sounds but it really hard. And I don't even hope to do sounds like Master Spark's.